While pockets within the City of Miami have buzzed with development and redevelopment over the past decade, bringing new retail centers with ever more glitz, Bal Harbour Shops, a mainstay in Miami for more than 45 years, remains a local favorite. If you’re new to the area, we’d like to introduce you to this gem of Bal Harbour, an upscale Miami suburb. First, if you’re hoping to open a business at Bal Harbour Shops, get ready to wait in line. There is a two-year waiting list of business owners eager to locate in the open-air shopping mall. 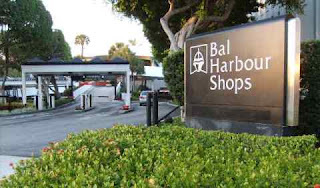 Bal Harbour Shops sits on what once was an army barracks and World War II prisoner of war facility. In the early 1960s, Stanley Whitman purchased the property for $2 a square foot, hired an architectural firm and, by 1965, with FAO Schwarz as the first tenant, Bal Harbour Shops opened the doors. Bal Harbour Shops was populated with mainly big-name department stores until Gucci opened its fifth U.S. store there. This move opened the flood gates and upscale fashion designers quickly followed suit, including Dolce & Gabanna and Chanel. Dining opportunities abound at Bal Harbour Shops with nine unique eateries from which to choose. In addition, the St. Regis Bal Harbour condos and hotel just opened a couple of months ago in front of Bal Harbour shops. Shuttle service to Bal Harbour Shops is available from South Beach and Miami Beach.